I sent Tomas Sabag and Hadas Feldman an e-mail to explain that our ice season was lasting longer. It was also over a larger area than anything we have seen in a while. The ice pack along the north and north east coast(and also reaching into the gulf to the west) may pose a navigational hazard to them if the proceed north in a clock wise direction. Our winds are continuing from a northeast direction, keeping the ice fast to the coast. They will be stuck in it. So that we may finally see summer, the winds should eventually move around to the west, but that may cause the ice in the north to move back against the tip of the western peninsula. I also let them know that this clockwise coarse would leave them heading into strong westerlies once they make it to the south coast for the final leg of their journey. It's not uncommon to be stuck for a week on that coast in the late summer, waiting for the weather to calm down. Clockwise or counter clockwise...it would be a sea kayaking challenge and a great adventure either way. They wrote twice to me about this, but their blog site explains their coarse of action just as well...As for the possible south coast winds, they explain that they will be so strong by that point. Last reason, that the well respected sea kayaker Jeff Allen said; going clockwise is good luck. Continue to monitor their site, this should be interesting. They departed mid day on Saturday. Also ice, weather and journey related. When Freya Hoffmeister was here at the KNL retreat last week, she saw her first iceberg...funny, all those travels, even to Greenland, but finally she found one. Her and Greg Stamer set off for a ten day trip heading south from St. John's. A new section of the coast for her too. You'll remember that she joined Wendy Killoran for the south coast portion of her 'Around the Rock' 2006 expedition. As for Freya, some days I wonder if she is planing to circumnavigate the whole island one visit at a time. At the rate she's going, that'll be less than half a dozen visits total. Neil, their Newfoundland ambassador, may have some word next week as to where they finish this trip. But just a note, they left last week in a force 5-6 gusting, heading straight out to the open north atlantic, rounding headlands including the most easterly point in all of North America...yes, Scotland has the next beach. I remember hiking that day thinking that it wasn't fit to kayak in bays, only to return home to learn they had gone out on a headland excursion. Good God. We are having lots of ice and cold temperatures so far this season. We can also expect to have lots of icebergs this year. People have mentioned how beautiful but dangerous they can be. I have a clip I'll post later. Also, I've soloed a bit lately, finding myself out on changing wind and waves...more on this later too. Speed tests in a 19 foot kayak. River play. Trying the wing blade... And web cam shots. Oh, and yes, I'll post about rum too! By all accounts, Greg Stamer and Freya Hoffmeister did a stellar job of instruction at this years KLN retreat. I'll do a little bit of a retreat round up with added photos later. But the above photo is of the amazing Freya in her Qaanaaq Greenland style kayak. I was only committed to attending this years retreat by Thursday, as some work I was waiting on was re-scheduled once again. The good side, was that I was able to load up the truck and head for the retreat weekend. I was obviously unable to pre-register for clinics, but still managed to see and learn quite a bit. Greg's talk and Freya's slide show from Greenland was very informative. And once back in town, they both gave some private lessons at the pool that many of us attended last night. It was all well worth watching. I must note that I was only on flat-water, with only a slight breeze...defiantly not the conditions that the kayak was designed for. But my biggest aim was to see if I even fit the boat, as well as it's maneuverability with my type of handling. So first off was to take it straight out with a proper forward stroke. I did not feel the kayak to be very fast, but it also did not feel as "grabby" as I have felt in something like an Explorer (a great NDK boat, that for some reason, just doesn't feel right to my body). I could not tell of the Rockpool's tracking, as there was not real winds, but it felt perfectly fine to me....I did feel it lay itself down into the water as I picked up speed. Edging?, wow, easy....but the thing I was more excited about was how well it handled when I leaned way over to each side to spin the boat around. I have a 19 foot kayak at present, so I've come to rely heavily on leaning to turn kayaks around. This Alaw Bach was just a joy to edge and lean in exaggerated ways....wonderfully playful and responsive. Bow rudder and hanging draw stokes a joy. As for rolling, laying on the back deck and closing my eyes as I rested my head was to nice...falling asleep was possible, but not advised at this time seeing as time was limited as Freya would want her boat back. High bracing was great. Both lay back and c to c rolls on both sides were easy. Not enough time for a re-entry and roll, but seeing as I found it fine to wiggle into from the back deck, all while first entering the cockpit on water with no support,...I don't feel it would be difficult. On heading back to shore, I did pull myself up on the back deck and paddle the rest of that way home. Good move as when borrowing someone else's boat, it's nice giving it back without a scratch. It was kind of Freya to lend me the kayak. I was in the kayak for only 20 to 30 minutes.....hmmm...felt shorter than that...but I'm impressed so far. This kayak is not meant to just sit straight up in. Hopefully, one of these days, I'll get a chance to try it on the open ocean. Would I like to own one of these boats?...well yes, but with Canadian customs and shipping fees from the UK, not likely. Let's hope some day that we'll get a few Rockpool distributors in this part of the world. Also a thanks to Douglas Wilcox who has a wonderful review of this kayak....I had been looking for any word about this boat since I first saw them in photographs and videos, but Douglas's review is great and helped in giving me a head's up in what to look for in the boat's characteristics. Also, Derrick Mayoleth will be receiving one soon...and writes daily on his blog about all things kayaking....so look for what he has to say about the Rockpool Alaw Bach in the future. It's time once again for this years seventh annual KNL Kayaker's Retreat. The weekend retreat is for white water and sea kayakers both. Guests for the WW crowd one year and then sea kayakers the next. A few years ago, we had the pleasure of a visit by Justine Curgenven. I still thank her for the introduction to moving water at the mouth of the Terra Nova river....interesting, fun and wet...my first time on moving water, and all in a 19 foot sea kayak. 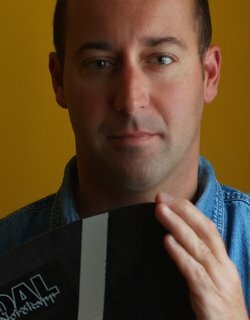 This year the Retreat guests will be Freya Hoffmeister and Greg Stamer. They will each teach Greenland rolling and stroke clinics over the next few days. There are usually around a hundred of us. We meet in Traytown, which is along the north east coast of the island. Ice free at this point, but further out to sea and all the way up north, there is still plenty of pack ice on the ocean. So it's still cool in this part of the world. Cooler than normal. Any forecasted highs, never seem to materializes.... and even when we do get the the odd high, the temperature usually touches 0c within a 24hr period.... still can't seem to shake winter's grip. A few days of sun though....just to remind us that summer is still coming. Rum may be the order of the day once we return from the sea each evening. Not much rain this spring, in spite of the cool temperatures....so rivers are down for the white water kayakers. Still good rivers, just not as high and powerful as many of them like. With little rain, wonder what the forest fire index will be once summer comes? As for Icebergs....lots of them along the coast. I'll drive around a bit and see what I can find this weekend as I travel north. May get lucky and find some close to shore while kayaking in the Traytown area. Also, Hadas Feldman and Tomer Sabag will be arriving on the island within the next week, to start their attempt at a circumnavigation of the island of Newfoundland. They will be heading out from the west coast of the island, so it may be well over a month before we see them near the St. John's area. Hopefully, many of us will get an opportunity to paddle with them. If all goes well, the temperatures will be up for the weekend....and that we'll see some icebergs too. I'll post photos after the weekend's events. I have still managed to get out in the kayak. Last week on a pond in town close to home. Then on a pond a few more minutes away at a higher elevation where the ice had only just melted off this past weekend. Only had to pull the kayak over one snow bank to get to the water. Okay, I couldn't resist, I had to roll. Ouch,.. ice-cream headache...left me dazed for a moment... Still, it feels good to work all those muscles for sea kayak paddling that haven't really fully been used for many months. The pool sessions are terrific for rescues, rolls and balance. But for a good forward stroke...nothing beats open water. Hadas and Tomer are very experienced on waters all over the world...and from what I can gather from their letter, they have researched and asked questions of people from all over, as well as here in Newfoundland. To which they point out that they are very thankful for people's help so far. LENDAL had sent their paddles ages ago to a guy named Simon Jansen from Pure Adventures in Corner Brook as well Nigel Dennis from NDK has sent one NDK Explorer- yellow on white and one NDK Greenlander....new design of carbon black on black...awaiting them with Ed at Explore NFLD, in Corner Brook. 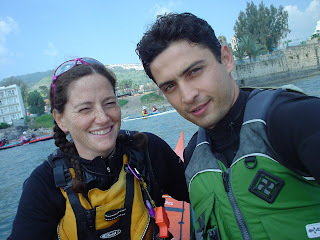 Good to see the kayaking community checking in on people's blogs and web pages from here... Hadas and Tomer both wrote "...we love checking out the pictures on your blog and cant wait to see it all live!!!!" I'm sure this place won't disappoint them. It should be noted that Derrick Mayoleth in the states has been posting and following along with their expedition closely.